LONDON - For a pet-obsessed nation, it's not surprising that the British go weak at the knees at the sight of a soft, furry puppet in a TV advert. Virgin 1 has just launched TV commercials with a knitted brand mascot called Red and Mother, which sired PG Tips' Monkey, is creating a marionette-style puppet for Diet Coke's sponsorship of Ugly Betty on Channel. Although there are examples of successful puppets such as Flat Eric, brands should be aware of ‘The Curse of the Advertising Puppet.' Sock spokesmen (and they are male) may be loved by the public but conspiracy theorists note the road to administration is paved with balls of wool: Monkey/ITV Digital, Woolworths/Woolie and Worth, pets.com/dog sock puppet. And while branding experts argue General Motors ended up in bankruptcy protection because it tried to support too many marques, we suspect the Vauxhall C'Mon puppets are really to blame. Here are the 10 most influential puppets in adverting, according to the muppets at Marketing. In 1999, an yellow puppet called Flat Eric managed to make Levi's cool again. As his friend Angel drove around LA in an old banger, Flat Eric tapped one hand to Techno music while the other clasped a cup of Wizz soda. The ads by Bartle Bogle Hegarty were a worldwide phenomena and the single Flat Beat hit the top of the charts and sales of Sta-Prest jeans went up too. This band of knitted puppets has been around since 2006 and we cynical muppets at Marketing should be predisposition to like them since they aren't cute and the war paint gives them a slightly disturbing look. Overall, however, DLKW's puppets have something of a manufactured boys' band feel about them that annoys. They also live an uber-cool flat, when proper ad puppets should live in student squalor. And while we try to maintain an open mind about what takes places between consenting adults, we do draw the line with cross-species relationships with hand puppets. A few years back, while one of the boys, Red, is in the shower, his gorgeous human date takes his Corsa for a joyride. More recently members of the public complained about the puppets driving around in their Corsa and leering at a female cyclist in tight-fitting cycling shorts. The greatest curse every wrought by a sock puppet comes from the other side of the pond. During the dot-com bubble at the turn of the millennium, pets.com raised $300m on the stock market. California hotshop TBWA\Chiat\Day created a crudely-made dog sock puppet that wielded a microphone. Pets.com won loads of ad awards and reportedly burned through an $11m ad budget in its short life, which including a memorable million-dollar Super Bowl ad. The puppet's catchphrase urged viewers to shop at Pets.com, ‘Because Pets Can't Drive!' and the same sock-puppet logic extended to a business plan that never figured out how to make a profit on shipping out low cost, bulky items like 25 pound bags of dog food. A recent ad parodies a Morecambe and Wise breakfast sketch of the duo enjoying a cup of tea. Monkey has the insight to know that the ritual that surrounds the making of tea is as comforting as drinking it. This ad even has Monkey milking a cow which as Learman points `Now that's just wrong, yet so right.'. How can an agency like Bartle Bogle Hegarty, whose own logo is a black sheep, have failed to woo the British public with dog and sheep puppets. One of the early signs that a sitcom is in terminal decline is cameo appearances by celebrities, and when Rolf Harris joined them flogging paint rollers we knew the end was nigh. Okay. Maybe there is no puppet curse - maybe it is the product and not the messenger or the agency. Mother first paired Monkey with Johnny Vegasin in 2001 and gave them the task of rebranding ONdigital as ITV Digital. Each delightful installment reaffirmed the intelligence of monkey over man. Despite Monkey's best efforts, ITV Digital bit the dust in 2002. Perhaps Monkey should now replace Michael Grade and run ITV instead of just flogging it. It takes soft toy monsters to provide the customer insight that children are monsters. In one ad from the 1980s, the tall Pink Monster dreams that Monster Munch crisps grow on tall trees, and that the other five monsters are too short to reach them. Each monster represented a different flavour, making them easy for tots to remember. The relatively large bags and strapline taught tots the concept of value for money: 'The Biggest Snack Pennies Can Buy'. Although legendary adman John Webster created the Smash Martians back in 1974, they still regularly crop up in polls of the public's favourite ads. Since the end of the end of 16th century, Brits have peel, boiled and mashed potatoes, so you've got to admire some tin puppets that challenge the dominant social consciousness and get people to eat instant spuds. The National Basketball Association play-offs always showcase its Most Valuable Players and this Nike ads turns real-life stars LeBron James and Kobe Bryant into muppets. The ad shows the players' habit of tossing chalk in the air before the game, but we question the wisdom of having piles of white powder in an athlete's home. 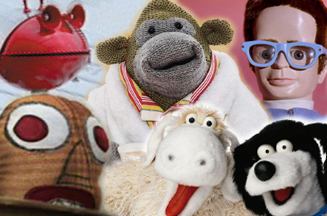 Have we missed any of your favourite puppets in advertising?